Theocritus (early third century BCE), born in Syracuse and also active on Cos and at Alexandria, was the inventor of the bucolic genre. Like his contemporary Callimachus, Theocritus was a learned poet who followed the aesthetic, developed a generation earlier by Philitas of Cos (LCL 508), of refashioning traditional literary forms in original ways through tightly organized and highly polished work on a small scale (thus the traditional generic title Idylls: “little forms”). Although Theocritus composed in a variety of genres or generic combinations, including encomium, epigram, hymn, mime, and epyllion, he is best known for the poems set in the countryside, mostly dialogues or song-contests, that combine lyric tone with epic meter and the Doric dialect of his native Sicily to create an idealized and evocatively described pastoral landscape, whose lovelorn inhabitants, presided over by the Nymphs, Pan, and Priapus, use song as a natural mode of expression. The bucolic/pastoral genre was developed by the second and third members of the Greek bucolic canon, Moschus (fl. mid second century BCE, also from Syracuse) and Bion (fl. some fifty years later, from Phlossa near Smyrna), and remained vital through Greco-Roman antiquity and into the modern era. 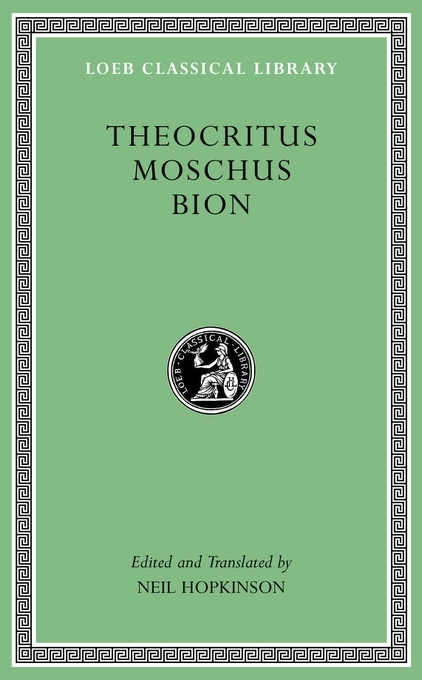 This edition of Theocritus, Moschus, and Bion, together with the so-called “pattern poems” included in the bucolic tradition, replaces the earlier Loeb Classical Library edition by J. M. Edmonds (1912), using the critical texts of Gow (1952) and Gallavotti (1993) as a base and providing a fresh translation with ample annotation.